While some horses march happily into trailers, many do not. Horses naturally live in wide-open spaces; they like light and plenty of room around them. As prey animals, getting into a trailer goes against a horse’s natural instincts. Still, you can get most horses to load quietly with time and patience. 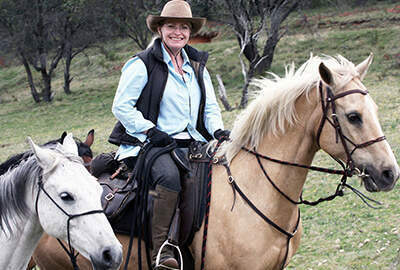 Plan Ahead – When you determine that your horse needs to make his first trip, it’s best not to wait until the day of the event to try to load him. If at all possible, start by working on trailer loading days or weeks before the event, so you can ensure that he’ll have more of a comfort level in loading and you won’t be pressed for time. Check the Weather – Do not attempt trailer loading training if it is raining or you have any bad weather. The extra noise on the roof of the trailer, coupled with any slippery footing, will just worry your horse even more. Wait for a clear, dry day to provide a good experience. 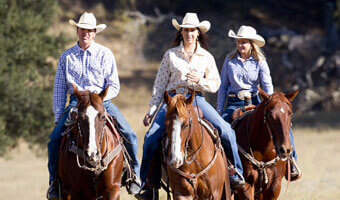 Bring a Buddy – It is ideal if your horse has a good buddy who is already trailer steady. Have a friend bring the buddy horse along when your horse checks out the trailer. Seeing his pal treating the trailer as a nonissue is a big help. Consider your Trailer Location and Type – Set your trailer up next to your turnout area, so that your horse can see it and become familiar with it. Consider your type of trailer. Stock trailers have more light and a more open “feel” than many fancy vans do. When you go to work your horse on loading, open up the trailer’s doors and windows to lighten up the interior. If you have internal lights, turn them on. Practice with Obstacles – Stock trailers have the advantage of being open, but the disadvantage of requiring your horse to step-up in most cases. You can set-up mini trail-type obstacles to lead or ride your horse over that mimic the trailer step-up or ramp. Practicing away from the actual trailer means that your horse will only worry about one thing at a time. If there is a steady horse in the barn, let that horse lead. Many horses will follow without any concern. Take your Time – Let your horse walk around, sniff the trailer and peer into it. No pressure – just let your horse explore. Do that briefly a couple of times a day. If he wants to step on the ramp, let him, but don’t force the issue. Reward the effort of trying with positive reinforcement. Don’t lose your temper or get frustrated, let him move at his comfort level. Let your Horse Adjust – Once your horse will step up into the trailer, do not rush to shut the door. Let him stand quietly and then back out carefully. Gradually have your horse remain in the trailer for longer periods of time. Ideally he should be steady in the trailer for at least five minutes before you close the door. If possible, have that steady buddy horse loaded in with him. Eventually your horse will have to adjust to riding alone, but initially it will be calming to have another horse with him. Keep Initial Trips Short – Work up to a ten minute interval with the horse loaded and ramp or door closed before you drive off. Keep the initial trips short with a minimum of stops, starts and turns. Your horse needs to learn how to ride in a trailer and balance. If he is calm, it will be easier for him to concentrate on the ride. Your greatest tools for teaching your horse to load are time and patience. A steady buddy horse is a wonderful added bonus, but there will be times when your horse will have to load alone. In those situations, consider giving him a calming supplement such as B-Kalm™ Paste to help ease some of his nerves. Overall, make sure that you have made the trailer a place where your horse wants to be and he will load easily and quietly. B-Kalm is a trademark of Farnam Companies, Inc.